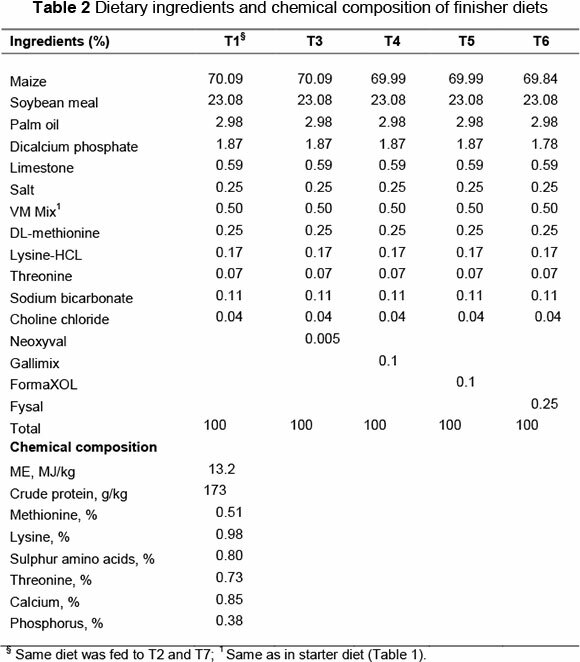 Four commercial organic acids and a reference antibiotic, Neoxyval, were administered to commercial broilers to evaluate the efficacy of these products during pre- and post-challenge with Salmonella enterica subsp. enterica Typhimurium (S. Typhimurium) on selected indicators of their antioxidant status and immune responses in serum. Two hundred and eight broilers received one of the following seven treatments: positive control group (CTL+); negative control (CTL-); antibiotic Neoxyval, (NEOX); Gallimix (GALI); FormaXOL (FORMA); Fysal (FYS); and Selko-pH in drinking water (SELK). The chicks in treatments T2 to T7 were challenged with (3 x109 cfu/mL) of S. Typhimurium on day 16. Each treatment consisted of 10 cage replicates with four birds per cage for a starter (0 - 14 days of age) and a finisher (15 - 42 days of age) period. The results revealed that the total antioxidant capacity (TAC) value was highest when birds were supplemented with organic acids, with the highest value for FORMA (0.70 mM), which was not different from those of the FYS (0.67 mM), SELK (0.66 mM) and GALI (0.64 mM) treatments. Birds receiving treatment, CTL-, produced the highest H2O2 value (75.9 μΜ), while, FYS, FORMA and SELK lowered H2O2 concentration significantly (51.1, 53.8 and 55.0 μM, respectively). Anti-Salmonella titre was significantly improved by dietary organic acid supplementation. 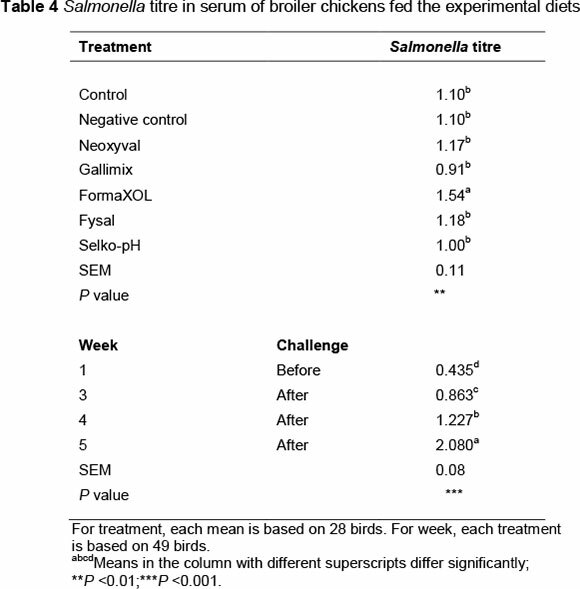 The highest Salmonella titre was recorded for birds that received FORMA (1.54) as compared with all other treatments. Week of sampling showed a significant effect on Salmonella and Newcastle disease titres. In summary, the tested organic acids, especially FORMA, had a positive influence on TAC and Salmonella titres and reduced the H2O2concentration in serum. Organic acids are among the alternative growth promoters that have been used in practice for decades and have been shown to stimulate growth performance in poultry (Dibner & Winter, 2002; Dibner, 2004). Several studies have suggested that organic acid supplementation to poultry diets acts as a bactericidal for Salmonella in the crop (Thompson & Hinton 1997), ceca and small intestine (Vogt et al., 1982) and ileum (Cengiz et al., 2012), thus providing better intestinal health for the bird to obtain maximum nutrient absorption. Organic acid supplementation to poultry diets has been shown to suppress the growth of certain species of bacteria, mainly acid-intolerant species such as Salmonella, E. coli, Clostridium perfringes, Listeria monocytogenes and Campylobacter (Van Immerseel et al., 2002). Several other reports have shown that organic acids might be helpful in improving immunity and gut health in broilers (García et al., 2007; Abdel-Fattah et al., 2008; Khodambashi et al., 2013). Organic acids have been shown to lower the pH in the animal intestines and as a result, disturbed bacterial growth. The non-ionized (undissociated) organic acids can infiltrate the lipid membrane of the bacterial cell wall and interrupt the normal physiology of certain types of bacteria by disrupting DNA and protein synthesis in the bacterium (Nursey, 1997; Ricke, 2003). Limited studies have been conducted to determine the effect of organic acids on antioxidant status and immune responses of broilers during pre- and post-challenge with Salmonella enterica subsp. enterica Typhimurium (S. Typhimurium). Therefore, in the present study, the objective was to evaluate the effect offour commercial organic acids on antioxidant status and immune responses of broiler chickens that were subjected to a S. Typhimurium challenge. Two hundred and eighty Cobb 500 broiler chicks were randomly assigned to seven treatments. Each treatment included 10 replicates, with four chicks per replicate. The birds were allocated randomly to the seven treatments: T1 = control group, unmedicated diet, unchallenged birds (CTL+); T2 = unmedicated diet + S. Typhimurium (CTL-); T3 = medicated diet with Neoxyval (0.05 g/kg diet) + S. Typhimurium (NEOX); T4 = Gallimix (1 g/kg diet) + S. Typhimurium (GALI); T5 = FormaXOL (1 g/kg diet) + S. Typhimurium (FORMA); T6 = Fysal (2.5 g/kg feed) + S. Typhimurium (FYS); and T7 = Selko-pH (1 mL/kg drinking water) + S. Typhimurium (SELK). The experiment was conducted on broilers from the age of 1 to 42 days. Feed and water were provided ad libitum, and the birds were maintained in a 24-hour light schedule. The chicks had been vaccinated for Marek's disease, Newcastle disease and Infectious bronchitis. A two-phase regimen, starter and finisher diets, were formulated in mashed form, which met or exceeded the recommendations in commercial practice in Saudi Arabia. 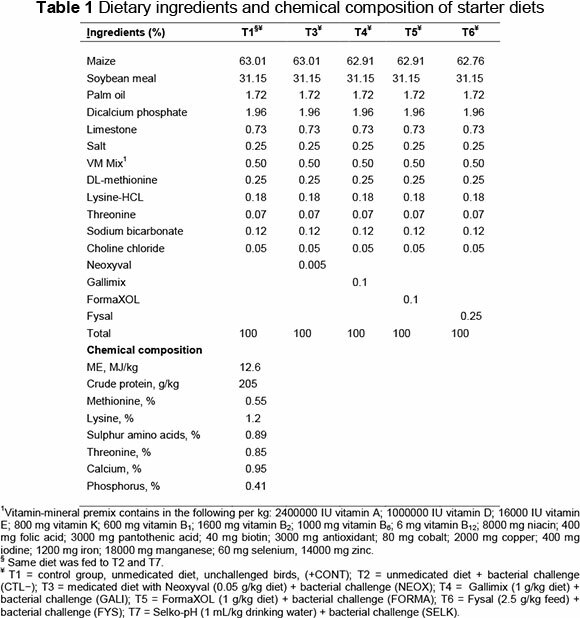 The composition of the diets is presented in Tables 1 and 2. Neoxyval® (Sogeval Laboratories, France) was used as the reference antibiotic and was compared to four organic acids (Gallimix®, FormaXOL™, Fysal® and Selko®-pH). Gallimix® (Intermedicavet) is an association of protected organic acids and essential oils. FormaXOLTM (Kemin Industries, Iowa, USA) is an antimicrobial compound composed of organic acids and essential oils. Fysal® (Selko® Feed Additives) is a blend of organic acids and their ammonium salts. Selko®-pH is a blend of free organic acids, which was included in the drinking water during the trial period. At 16 days of age, chicks in treatments T2 to T5 were challenged with S. Typhimurium (3 x109 CFU/mL). The strain used in this experiment was S. Typhimurium ATCC13311. Chicks were gavaged with 1 mL of a cocktail containing 3 x109 CFU/mL S. Typhimurium, which was obtained commercially (Microbiologics, Cloud, Minn., USA), according to the procedure described by Abudabos et al. (2014). Serum was used to estimate total antioxidant capacity (TAC), superoxide dismutase (SOD, EC 1.15.1.1) activity and hydrogen peroxide (H2O2) concentration, using analytical kits (Cell Biolabs, Inc., San Diego, Calif., USA). For this purpose, blood samples were collected on day 42 from seven selected chicks from each treatment via brachial venipuncture into plain tubes. The blood was centrifuged at 5 °C and 3000 rpm for 10 min. Serum was harvested and then transferred into Eppendorf tubes and stored at -80 °C until the time of analysis. The immune responses to Salmonella antibody were determined by the enzyme-linked immunosorbent assays (ELISA) (BioChek, London, UK). Blood samples were collected from seven selected chicks from each treatment on days 7 (before bacterial challenge), 21, 28 and 35 (after the challenge), and serum was harvested. For the chicken S. Typhimurium antibody test, microtitre plates were used that had been pre-coated with inactivated S. Typhimurium antigen. Serum samples were diluted (1 : 100) with a diluent reagent and were added to the microtitre wells where any anti-S. Typhimurium antibodies present will bind and form an antigen-antibody complex. Anti-chicken IgG labelled with the enzyme, alkaline phosphatase, was added to the wells. Then the substrate was added in the form of pNPP chromogen, and absorbance was measured at 405 nm with a microtitre plate reader. The Newcastle disease virus antibody test kit (IDEXX Laboratories, Inc., Westbrook, Maine, USA) was used to detect antibodies to Newcastle disease. Serum samples were diluted (1 : 500) with a diluent reagent and 100 μL of samples were added to the microtitre wells. Wells were incubated for 30 minutes at 18 - 26 °C, and then washed with 350 μL distilled water. Then 100 μL of conjugate were dispensed into each well, after incubation for 30 minutes at 18 - 26 °C, 100 μL of TMB substrate solution were dispensed into each well and 100 μL of a stop solution were dispensed to stop the reaction. Absorbance was measured at 650 nm. At days 41, 42 and 43, three birds were selected per treatment/day, totalling nine birds per treatment, for measurement of organ weight. After euthanasia, feathers, head and shanks were removed and the remaining carcass was weighed. The liver, bursa of Fabricius, spleen and thymus were collected and weighed. The weight of each part was calculated as a percentage of dressed carcass weight. Data were analysed using the general linear model procedure of SAS (2002-2003). Seven treatments were arranged in 10 replications in a randomized complete block design. Means for measurements showing significant differences in the analysis of variance were tested using the PDIFF option. The overall level for statistical significance was set at P <0.05. All values were expressed as statistical means ± standard error of the mean (SEM). Salmonella Typhimurium is an enteric bacterium that can colonize chickens, and is a serovar that is known to cause salmonellosis in broiler chickens (Ribeiro et al., 2007; Van Immerseel et al., 2009). Growth performance parameters in broilers may be regarded as indication of the severity of S. Typhimurium infection. Body weight gain was found to decrease from 14% to 33%, and feed conversion ratio to increase by 5% to 20% (Chalghoumi et al., 2009; Abudabos et al., 2014). Oxidative stress is a physiological condition in which there is an imbalance between concentrations of reactive oxygen species (ROS) such as H2O2 and antioxidants. Excessive accumulation of ROS will lead to cellular injury, such as damaged DNA, proteins and lipid membranes. It is accepted that changes in various antioxidant enzyme activities can be used to estimate the level of oxidative stress and total antioxidant status. In this trial, serum from birds was used to estimate TAC, SOD activity and H2O2 concentrations with ELISA kits and the results are presented in Table 3. Under normal physiological conditions, cellular ROS generation is counterbalanced by the action of cellular antioxidant enzymes and redox molecules. The TAC value was highest (P <0.001) for birds that received FORMA (0.7 mM) and this value was not significantly different from birds that received FYS, SELK or GALI (0.67, 0.66 and 0.64 mM, respectively). The lowest value was recorded in birds that received treatment CTL+ (0.54 mM), which was not different to that of NEOX (0.61 mM). According to Erel (2004), TAC reflects precisely the antioxidative status of the organism. On the other hand, SOD activity was not affected by treatment (P >0.05). Superoxide dismutase catalyzes the dismutation of the superoxide anion into H2O2 and molecular oxygen is considered one of the most antioxidative enzymes. The H2O2 concentration was highest (P <0.001) for birds that received treatment CTL- (75.9 μM) and this value was not significantly different from that of birds that had received treatments CTL+, NEOX or GALI, (70.5, 68.4 and 65.4 μM, respectively). The lowest value was obtained from birds that received FYS, FORMA and SELK (51.1, 53.8 and 55.0 μM, respectively). Hydrogen peroxide is one of the best-documented ROS produced under oxidative stress conditions, which is a toxic product of normal aerobic metabolism and pathogenic ROS production involving oxidase and SOD reactions. The results for antibody responses against Salmonella are presented in Table 4. There was a significant treatment x week interaction (P <0.001). The Salmonella titre continued to increase from week 1 through to week 5 for birds that received treatments CTL-, NEOX, FYS and SELK. For treatment CTL+, the titre increased from week 1 to week 3, then decreased in week 4. For GALI, the titre increased until week 4, then decreased in week 5. For FORMA, the titre decreased from week 3 compared with week 1, then it increased in weeks 4 and 5. Treatment, on the other hand, had a significant effect on Salmonella titre: The highest titre was obtained from birds that received the organic acid, FORMA (P <0.001). Beneficial effects of organic acids supplementation on broilers immunity have been reported (Abdel-Fattah et al., 2008; Khodambashi et al., 2013). It was suggested that improvement in bird immunity could be related to the inhibitory effects of organic acids on gut system pathogens (Khodambashi et al., 2013). On the other hand, week showed a significant effect on Salmonella titre: Week 5 had the highest value (2.08) and week 1 had the lowest value (0.435) (P <0.001). The Newcastle disease titre results are shown in Table 5. 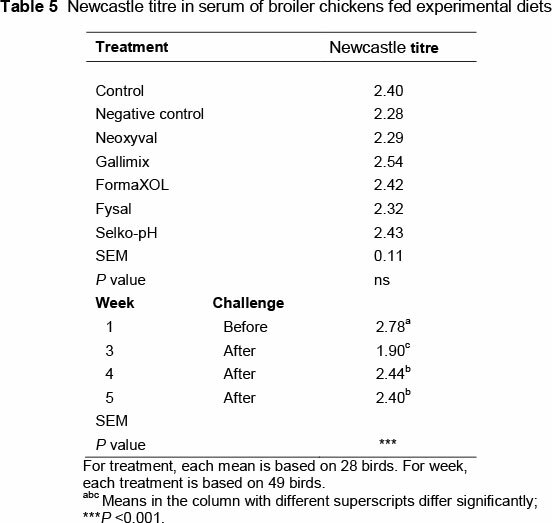 Treatment showed no effect on Newcastle disease titre. However, there was a strong effect for the week (P <0.001): The titre was high in the first week before the challenge, then dropped significantly after the challenge in week 3 (2.78 vs. 1.90). In weeks 4 and 5, it increased to a level higher than week 3, but less than in week 1. The Newcastle disease titre values were 2.78, 1.90, 2.44, and 2.40 for weeks 1, 3, 4 and 5, respectively. Lessard et al. (1995) found that S. Typhimurium-infected birds had higher antibody titres in response to Newcastle disease vaccination compared with uninfected birds. Houshmand et al. (2012) concluded that the dietary addition of organic acids significantly increased the antibody titres against Newcastle disease compared with the control group. The mean weight of organs as a percentage of carcass weight is documented in Table 6. 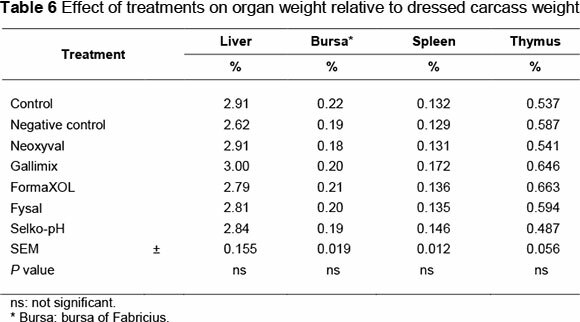 Treatment had no effect (P >0.05) on weight of the liver, bursa of Fabricius, spleen or thymus relative to dressed carcass weight. Conversely, Abdel-Fattah et al. (2008) concluded that organic acid supplementation to broilers resulted in heavier immune organs (bursa of Fabricius and thymus). 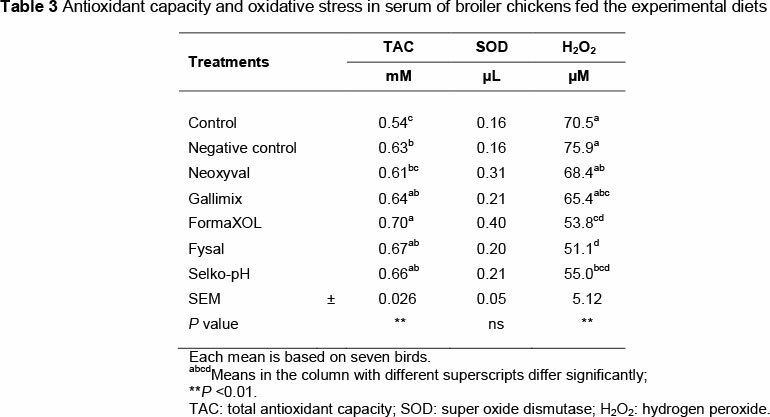 In summary, organic acids used in this trial (especially FormaXOL) increased the total antioxidant capacity, improved the immunological responses of broiler chicks, especially for Salmonella, and reduced oxidative stress conditions in broilers by lowering the concentration of H2O2 in the serum. S. Typhimurium-challenged birds (CTL) had the highest oxidative stress. Organic acids were able to eliminate the negative effects of the S. Typhimurium challenge and improve the immune system. The authors would like to extend their sincere appreciation to the Deanship of Scientific Research at King Saud University for funding this research through Research Group Project No. RGP-VPP-273.